Downtown Detroit Hotel Near Citys Top Businesses and Attractions Welcome to the Crowne Plaza Detroit Downtown Riverfront. Our hotel sits on the historic site of Fort Pontchartrain, adjacent to Cobo Center. We are centrally located in the Financial District, so whether youre traveling for business or leisure, the Crowne Plaza Detroit puts you in the heart of it all. With our close proximity to the Detroit People Mover and QLINE transportation systems, our guests can easily get to the Fox Theatre, Ford Field, Greektown, and Little Caesars Arena to enjoy year-round events and entertainment. Our prime location is ideal for business travelers as well, with many corporate offices being minutes from our property. Our accommodations offer complimentary Wi-Fi, an indoor pool, and 24-hour Fitness Center. We also have 32,000 square feet of meeting and event space, with professional on-site catering and banquet services. Urban Cellars, our full-service restaurant and bar, is open daily and serves modern, American cuisine. Each of our 367 guest rooms and suites are equipped with Keurig Coffee Makers, a mini-refrigerator, and unmatched views of the city or Detroit River. Urban Cellar's Breakfast: Urban Cellars is a modern American restaurant that utilizes a mixture of imported and fresh local offerings in a casual setting. Urban Cellar's Lunch and Dinner: Urban Cellars is a modern American restaurant that utilizes a mixture of imported and fresh local offerings in a casual setting. Childrens's program - There is an indoor heated pool, whirlpool, and sauna. Windsor Ballroom: The Windsor Ballroom can accommodate up to 300 persons for a Banquet or Reception. It is located in the main lobby. Flexible divider walls can separate this ballroom into 3 individual meeting rooms ideal for a General Session and breakout rooms. Executive Board Room: Meeting location directly off the Lobby floor,, Board Room table with comfortable ergonomic flexible chairs. Room equiped with flat screen TV, wireless internet and connections for laptop presentation and conference phones. Plaza Ballroom: The Plaza Ballroom is a beautiful space that splits equally into three sections and is located on the Terrace level of the hotel. The space has city views. Grand Terrace Ballroom: The Grand Terrace Ballroom opened May of 2018. 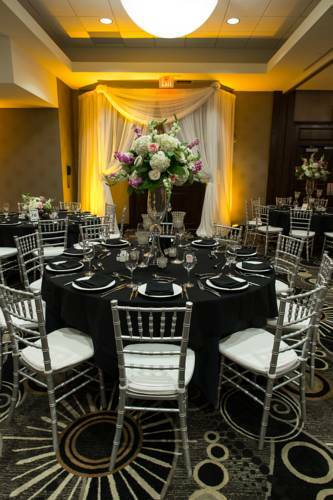 This ballroom offers a total of 10,455 square feet of flexible meeting and event space. The room can be divided into 3 different sections, two of which have natural lighting and outdoor access. Terrace A: Terrace A is the ideal location for small meetings or to be used as breakout space. Terrace B: Terrace B is located on the mezzanine level. It provides great space for smaller meetings and breakout sessions. With its natural lighting and views of the city and river, it won't disappoint. Terrace C: With its views, natural lighting, and square footage, Terrace C is perfect for a cocktail reception or smaller meetings. This room has a door that leads out to the outdoor Balcony as well. Chandler Park Golf CourseChandler Park Golf Club is a Par 71 golf course. Playing just under 6000 yards from the tips and just over 4500 yards from the forward tees. Little Caesars ArenaLittle Caesars Sports and entertainment arena is the home of the Detroit Red Wings and the Detroit Pistons and numerous entertainment options. The stadium is located just minutes from the hotel. Arena opened September 2017.